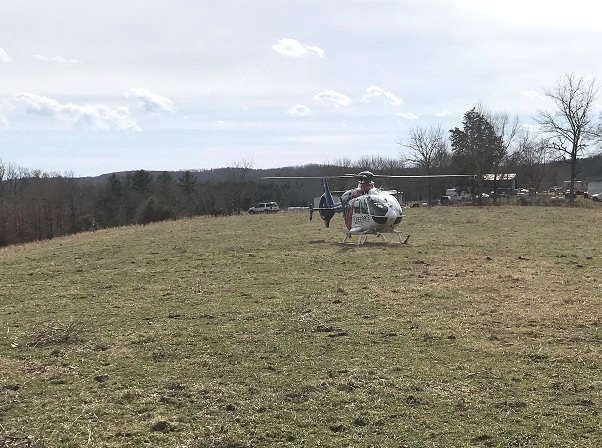 Karen House : Jan. 28, 2019, 1:27 p.m.
Life Force helicopter landed in a field on Lewis Chapel Sunday to pick up an injured man. Photo by Det. Jason Harvey. Jan. 28, 2019 – A 70-year-old man on Lewis Chapel was injured Sunday when a large tree that was being cut fell on him. Life Force helicopter was called and air-lifted the man to Erlanger in Chattanooga with unknown injuries. The Sequatchie County Sheriff's Office (SCSO) was called at 11:30 a.m. Sunday, Jan. 27, and when they arrived at 1456 Lewis Chapel Rd., the man was out from under the tree but appeared to have serious injuries, according to Detective Jason Harvey. The sheriff's department, Puckett EMS, and Lewis Chapel Volunteer Fire Department responded to the scene of the accident, but due to conditions, the ambulance was not able to get out to where the injured man lay. The truck transported the man to a high, level spot in the field, where the Life Force helicopter was able to land. The current condition of the victim is unknown.